Houston also boasts some wonderful attractions and distractions on the city's limits and Gulf Coast. 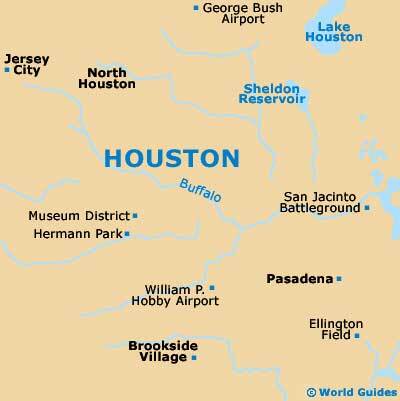 Getting away by car is made easy by Houston's superb network of interstate highways, freeways and orbitals. The Galveston Beach area is close to Houston and a great spot to retire to for the day via the Pasadena Freeway, or I-45. Attractions here include the excellent Gulf Greyhound Park, bustling Kemah Boardwalk and the all-encompassing Moody Gardens complex, where the world's geography is showcased in a series of impressive pyramids. Located to the southwest of downtown Houston, George Ranch is a 480-acre historical park featuring a 19th-century Victorian mansion, an even older stock farm, plenty of hands-on attractions and much history. For those who are interested in ranching the way it used to be, George Ranch Historical Park is a must-see! The Gulf Greyhound Park is situated to the south of Houston and north of Galveston and boasts the world's largest greyhound racing set-up. Horse racing can also be enjoyed here and the facilities are excellent, with attractions including the well-equipped Terrace Clubhouse Restaurant featuring frequent promotional nights. 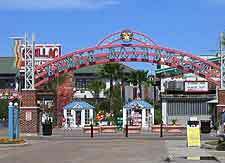 Situated 20 miles / 32 km from downtown Houston in the picturesque Galveston Bay, Kemah Boardwalk is a hive of activity and features numerous shops and delicious seafood restaurants in a 35-acre / 14-hectare area complete with carousel and large Ferris wheel. A mini train provides transport around the complex. Located on Galveston Beach about one hour from downtown Houston by car, Moody Gardens is an impressive complex of huge pyramids containing a host of attractions, including an aquarium, IMAX 3D theater, discovery center theater and the beautiful Palm Beach. Explore the world's oceans at the Aquarium Pyramid, wander among the exotic plants and animals of the Rainforest Pyramid and learn about science in the Discovery Pyramid or bask in the luxury of the Moody Gardens Hotel and Spa; Moody Gardens has it all. The San Jacinto Battleground is the spot where Texas became independent from Mexico and is not far from downtown Houston. Marking the momentous battle and occasion is the world's tallest memorial, the San Jacinto Monument column. Standing at 570 feet / 174 meters, the memorial is also part of the complex that includes the San Jacinto Museum of History and the Battleship Texas. Attractions at the memorial include true accounts of the Battle of San Jacinto and hourly screenings of 'Texas Forever' in the Jesse H. Jones Theater. Ideal for the kids and located on the I-610 loop and within easy reach of Houston, the Six Flags Astroworld park is loaded with fun rides and attractions for the whole family, including a suspended looping rollercoaster and Dungeon Drop, a lofty white-knuckle ride, and Looney Tunes Town for the toddlers. Next door to Astroworld is the much vaunted WaterWorld, a huge water park that features a raft ride and a tree house. Recent additions to the parks include SWAT, a fast catapult ride, and the impressive Diablo Falls water slide.